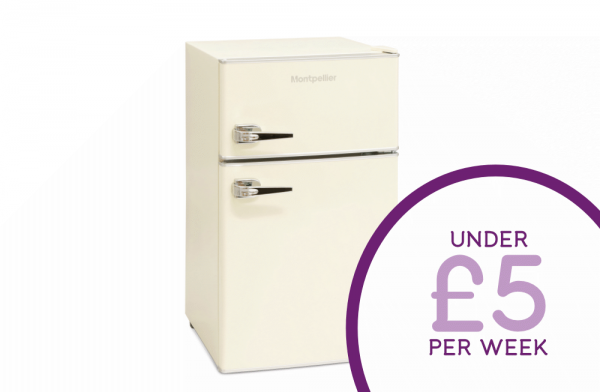 The 1950's style of this Montpellier Undercounter Cream Fridge Freezer brings a retro feel to your kitchen. Designed to be compact, its perfect for smaller kitchens or a retro themed kitchen. The retro style is continued inside with glass sections and integrated lighting. The door features a convenient can compartment for your soda which prevents cans from falling out of your fridge when the door is opened and closed. Built-in thermostatic control gives you the ability to set the temperature exactly how you want it. With five settings to choose from, you can lower the temperature to quickly cool new groceries, then increase it for ideal every day cooling conditions.